CinemaTech accredited designers with years of experience work for you to create the most memorable designs. Sophisticate one of a kind luxurious theaters that perform as well as they look. 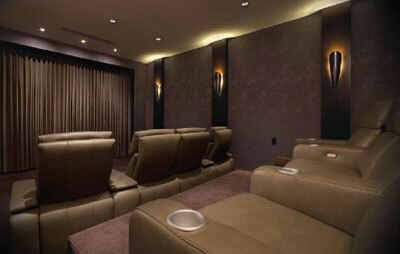 Designed, crafted and installed by CinemaTech artisans. CinemaTech Theater Designs offer a limitless portfolio of custom home theater designs for you to begin creating your very own theater from. You are guided through the entire process by our knowledgeable, friendly and professional team. Once design and fabrication are completed you can be assure that your theater will arrive on time and be installed to your complete satisfaction. CinemaTech can offer its clients an acoustical room solution that enhances the sound and the beauty of one’s home theater. The heart of CinemaTech ARS is a series of 1.25” low profile, fused sheetrock and fiberglass panels engineered for acoustic perfection. Premium sound quality is only achieved through proper engineering and acoustic modeling of each individual room. Constructed and installed on-site, the strategically placed reflective, diffusive, and high and low frequency absorptive panels manage and manipulate the frequencies throughout the room. CinemaTech tailors each ARS installation to accommodate the individual characteristics of each and every room. The components are then installed by trained and certified professionals. 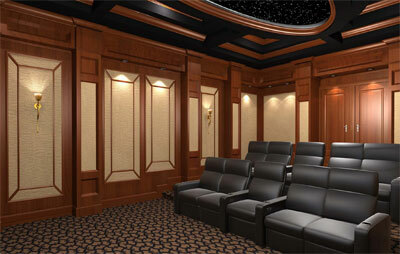 Off Broadway Home Theater Seating was developed specifically to address the need for custom seating in the dedicated and non-dedicated home theater. With over 6 decades of experience to draw from Fortress rapidly became the ‘go to’ company when off-theshelf seating was not the answer. A telescoping mechanism allows the footrest to fit neatly beneath the seat creating a smooth, well-styled line. Steel is used throughout all Act I models providing maximum structural integrity. 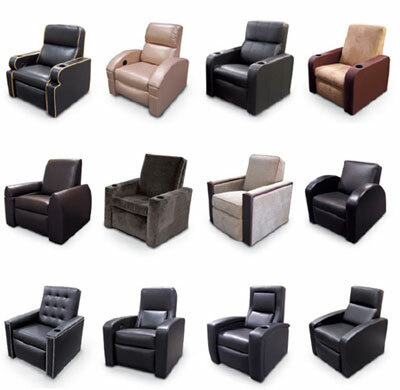 Most chairs are built on a wood frame that loses strength over time, sacrificing comfort and durability. Only CinemaTech uses an all steel chassis, like an expensive automobile. No one else offers such strength and support. Home theater seating is not something that can be replaced every 2–3 years, and interior seat reconstruction is highly expensive in the long term. Quality is the first and best solution. This exclusive process is unique in its ability to protect from stains while not affecting the leather's "hand". CinemaTech offers an industry-leading five-year limited warranty on all of our leathers for normal household usage. This standard feature on all Act I models provides super smooth, non-motorized operation with infinite lockable positions. You can connect your seats in several different ways. Combine two or three seats together for a love seat or sofa. We also have 5 different styles of connecting arms to create different custom looks. A straight arm places the seats in a parallel position for direct viewing. The wedge angles the seats in a slight arc for better viewing of the presentation. Our 17" control arm offers placement of a wired touch-panel control. CinemaTech Seating uses heavy steel springs to minimize "reflection" or bounce, while maximizing support and comfort. To insure proper placement, each coil is hand tied to the others during the manufacturing process. This assures long-term comfort and durability. When spending thousands of dollars on audio components and acoustical treatments for your home theater, it would be a shame to then block that great sound quality with bulky headrests. Our infinitely adjustable headrests, standard option on all Act 1 models, ensures maximum acoustical benefit without compromising personal comfort and neck support. Even in full recline, our headrests assure easy and comfortable viewing of the presentation. While competitors boast of 2 or 3 reclining positions, CinemaTech Seats stop in position as you release the motor control, allowing for an infinite number of positions. The 24v, low-voltage motor is quiet yet powerful (3,800 lbs. of torque!). Our seats have a standard width of 24 inches to accommodate any person. Everyone in the family will find CinemaTech seats a comfortable fit. While the US seating standards have an average of 0.7 to 0.8 density rating, CinemaTech's seating has 1.2 density rating. Giving the viewer much more support while not compromising softness. This higher density rating may be more expensive in the short term, however it also ensures many more years of uncompromising support and comfort regardless to the level of use.